These brass powder horn base plugs are designed to be installed in the base (large end) of a powder horn. This decorative but functional piece provides a removable plug for easy filling of the horn and a place to tie one end of the horn lanyard. 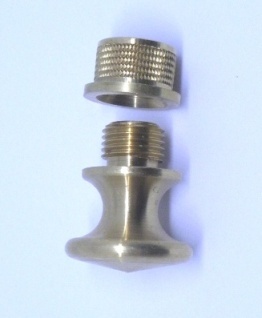 The plug comes with a knurled brass bushing that is permanently glued into the horn base. These plugs are available in two sizes. The large one is 1" in diameter with a 1/2”-20 thread; the small one is 5/8” in diameter with a 3/8”-24 thread.